A few days ago, my little boy had kid’s fair in his kindergarten. All children are supposed to come with masks and parents were asked to prepare cakes for sale. The first task was easy. My son immediately decided that he wanted to be the chef, so I did not have to put too much effort to made the costume. He wanted only chef’s hat, apron and a wooden spoon. I tried to convince him to get on his pirate costume but he was so excited to be a chef. However, his wish was fulfilled and he was the cutest chef I’ve ever seen. I was very proud of my little chef. But the second task wasn’t so easy. I had to decide what to bake for sale. I needed something that was tasty, what looks good and what will certainly sell well. Since most parents bring cookies or cupcakes, I wanted something a little different. 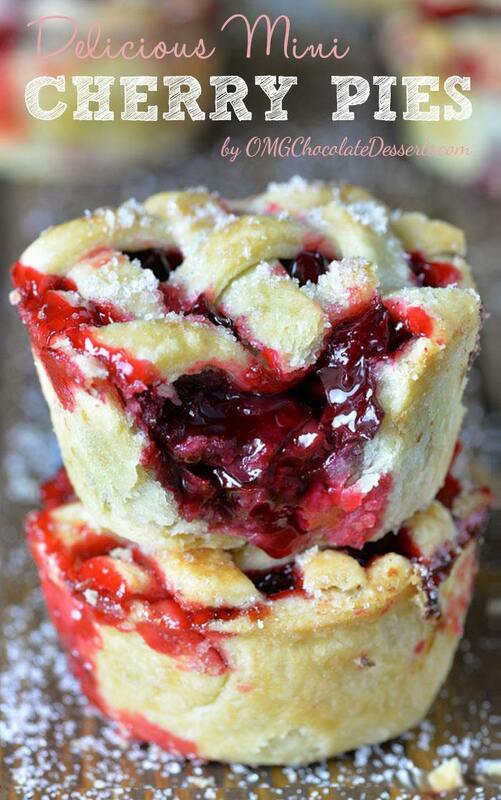 After a little search on the internet I find these Mini Cherry Pies. They would be great for sale. They are easy to serve and I was sure that the kids would be ecstatic to have they’re own tiny pie! For these adorable little pies, I used store bought pie crust but if you to make a scratch one from scratch you can use this recipe. 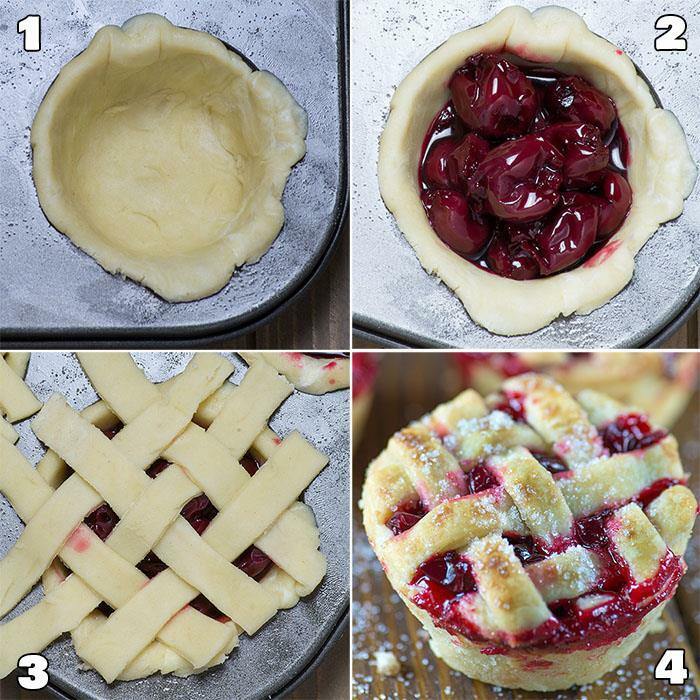 You just need to roll out the crust, cut the 3 ½ inch circles and press them in well-greased muffin tin cavities, then scoop some cherry pie filling into each one. From the second pie crust you should cut 1/3 inch strips and make the lattice top like for the regular pie, sprinkle some sugar and pop them in the oven for about 25-30 minutes or until they gets nice golden tops. 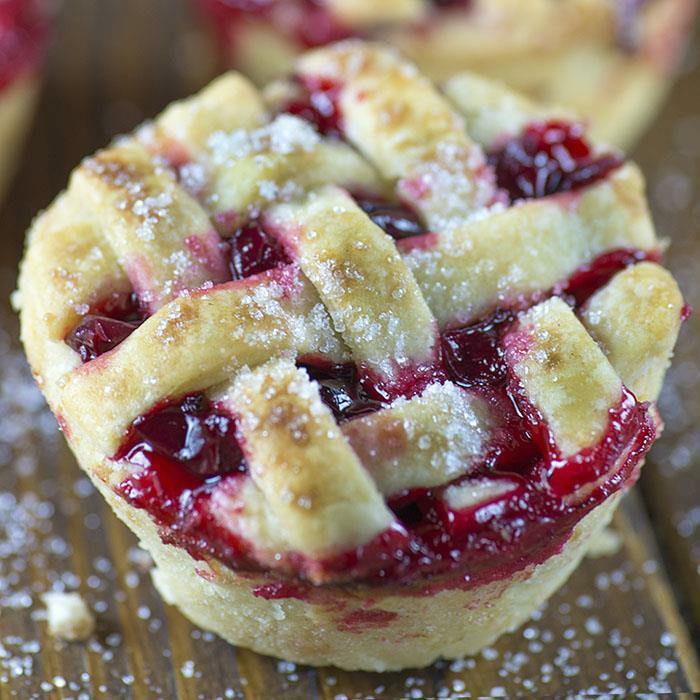 These Mini Cherry Pies turned out to be adorable. They were a huge hit at the fair and my little chef quickly and easily sold his pies and earn money for his group in kindergarten. Unroll one crust onto a flat surface and using a cookie cutter or rim of a glass/bowl cut 3 1/2 – 4″ circles. Place each circle into tin cavity and press into the bottom and up the sides. Fill with cherry pie filling about 2/3 to the top. To make a lattice crust, using a knife or pizza cutter cut thin strips of dough (about 1/4-1/3 inch), then lace together to form a lattice. Press down slightly around the edges and trim the excess with a knife. Brush the tops of each pie with the whisked egg white and sprinkle with sugar. Bake for 25-30 minutes (until the crust is lightly golden and the filling begins to bubble). Let them cool in the pan for at least 15-20 minutes. Using a knife very carefully loosen the edges of each pie and gently lift it out. Can I bake these the day ahead? IF so do I store in fridge or no? Do I need to reheat?THX! Hi Linz, you could bake this day ahead and don’t have to keep them in the fridge or reheat. Hi Phyllis,I’m sorry I haven’t tried this with pumpkin so I cant help you about that. These look amazing, and sound delicious! I can’t seem to find your recipe for cherry pie filling, and I’m a newbie when it comes to cooking and baking. Alexandra you can buy several different kinds of prepared pie filling in the baking products isle of your grocery store. You don’t have to make your own although you can do a google search for a recipe or go to pinterest and perform a search there. Good Luck! Can you make these the day before and keep in the fridge until you are ready to cook them? I think it won’t work well,sorry. What a simple and yummy way to make bite sized treats for guests! I love this idea!! The pre-formed pie crust is incorrect. It says in the ingredients 1 pkg of pie crust. They are two pie crusts that are rolled up in the box. You unroll them, and then cut your circles. The crust is thick enough that it will not break down during baking. Linda, You can find them in the refrigerator section by where they pre-made sell cookie dough. Near the eggs! OMG I’m SO glad I decided to scroll the comments. I’m baking a bunch for a party I’m throwing on Saturday & I had no idea that the rollout dough existed either. I bought 6 pie crusts on the tin plate. I would have been short a dessert on the dessert table if it didn’t work out!!! 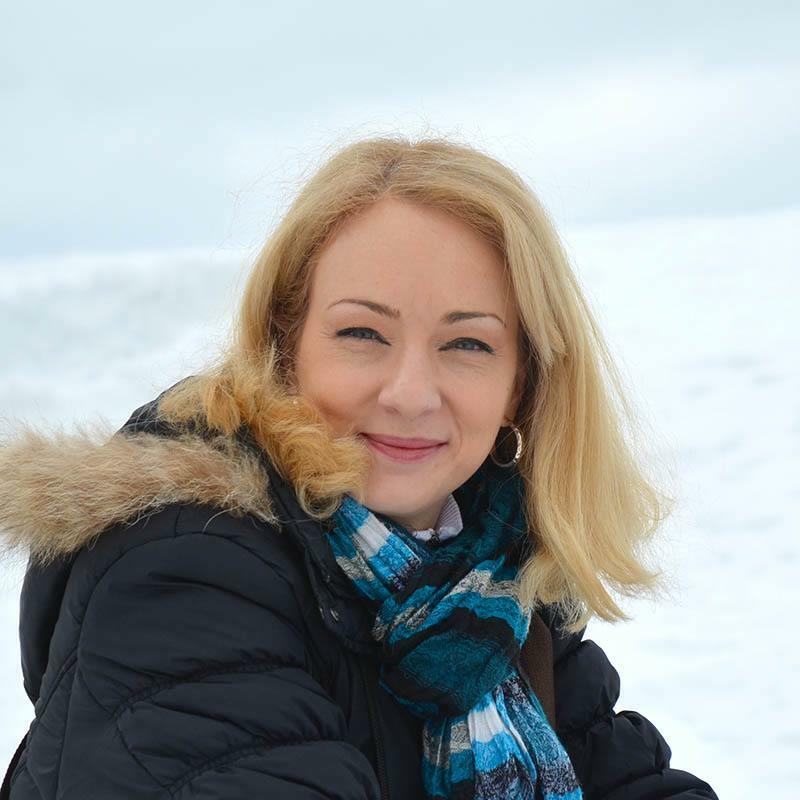 Thanks everyone for your questions & comments! Has anyone made these in a mini muffin tin (24 ) ? Are you using mini muffins tins or regular 12 muffin tin? Hi Connie, use regular, not mini. Could I cut out a star dip in sugar instead of lattice crust?